To assess the contribution of TLR signaling in the host response to Borrelia burgdorferi, mice deficient in the common TLR adaptor protein, myeloid differentiation factor 88 (MyD88), were infected with B. burgdorferi. MyD88-deficient mice harbored extremely high levels of B. burgdorferi in tissues when compared with wild-type littermates and greater amounts of spirochetes in tissues than TLR2-deficient mice. These findings suggest that, in addition to TLR2, other MyD88-dependent pathways play a significant role in the host defense to B. burgdorferi. MyD88−/− mice maintained the ability to produce Abs directed against B. burgdorferi. Partial clearance of spirochetes was evident in long term infection studies and immune sera from MyD88-deficient mice were able to protect naive mice from infection with B. burgdorferi. Thus, the acquired immune response appeared to be functional in MyD88−/− mice, and the inability to control spirochete numbers was due to a failure of cells involved in innate defenses. Although macrophages from MyD88−/− mice responded poorly to Borrelia sonicate in vitro, MyD88−/− mice still developed an inflammatory arthritis after infection with B. burgdorferi characterized by an influx of neutrophils and mononuclear cells. The findings presented here point to a dichotomy between the recruitment of inflammatory cells to tissue and an inability of these cells to kill localized spirochetes. Lyme disease is caused by the vector-borne bacterium Borrelia burgdorferi (1). Clinical manifestations of Lyme disease include development of a subacute inflammatory arthritis, myocarditis, neurological complications, and skin abnormalities (2). Arthritis occurs in 60% of individuals not treated after infection with B. burgdorferi and is characterized by edema, inflammatory cell infiltration, and hyperproliferation of the tendon sheath in joint tissue (2, 3). The murine model of Lyme disease has provided an excellent system for studying the development of Lyme arthritis and factors that contribute toward the host response to B. burgdorferi (4). The development of arthritis is associated with spirochete presence in joint tissue. indicating that B. burgdorferi products are necessary for the inflammatory response (5, 6). B. burgdorferi lipoproteins possess potent inflammatory properties and are able to activate multiple cell types including endothelial cells, neutrophils, macrophages, and B lymphocytes (7, 8, 9, 10). As part of the innate immune response, TLRs are involved in the detection and response to pathogen components. TLR signaling occurs on recognition of pathogen-associated molecules including LPS (11, 12, 13, 14, 15), unmethylated CpG DNA (16), bacterial flagellin (17), dsRNA (18), bacterial lipoproteins (19, 20, 21, 22), and peptidoglycan (23, 24). Borrelia lipoproteins are able to stimulate cells by signaling through TLR2 (19, 20, 21, 22), using TLR1 as a coreceptor (25, 26). Studies using macrophages from TLR2-deficient mice suggest that additional TLRs may be involved in signaling during the inflammatory response to B. burgdorferi (27). To better understand the contribution of TLR signaling toward inflammatory arthritis development, mice lacking a common component of TLR signaling were investigated. Myeloid differentiation factor 88 (MyD88)3 is a shared adaptor molecule in IL-1, IL-18, and TLR signaling (28, 29, 30, 31, 32). The importance of MyD88 as a common component of TLR signaling is highlighted by observations that MyD88-deficient mice have increased susceptibility to infection with pathogens including Staphylococcus aureus (33), Listeria monocytogenes (34, 35), Toxoplasma gondii (36), and Mycobacterium avium (37). Additionally, MyD88-dependent responses have been found to be essential in streptococcal cell wall-induced joint inflammation (38), supporting the importance of TLR signaling in disease pathology. In this report, the requirement for MyD88 in the inflammatory response and host defense to B. burgdorferi was determined. MyD88-deficient mice were provided by Dr. Shizuo Akira (31) and were maintained as heterozygous breeding pairs at the sixth generation backcross on the C57BL/6 background. MyD88−/−, MyD88+/−, and MyD88+/+ littermates were genotyped as described (39). TLR2-deficient mice were provided by Tularik (San Francisco, CA) and generated by Deltagen (Redwood City, CA) (40). All TLR2−/− mice were on the 10th generation backcross to C57BL/6. B6.CB17-Prkdcscid/SzJ (scid) mice were purchased from The Jackson Laboratory (Bar Harbor, ME), whereas C57BL/6 and C3H/HeN mice were obtained from the National Cancer Institute (Bethesda, MD). Mice were housed in the Animal Resource Center at the University of Utah Medical Center (Salt Lake City, UT) according to the National Institutes of Health guidelines for care and use of laboratory animals. Passage 4 spirochetes of the N40 isolate of B. burgdorferi (provided by S. Barthold (4) at the University of California were cultured in Barbour-Stoenner-Kelly H (BSK-H) medium containing 6% rabbit serum (Sigma-Aldrich, St. Louis, MO) for 4 days before infection. MyD88−/−, MyD88+/−, and MyD88+/+ littermates between the ages of 7.5 and 10 wk were infected intradermally with 2 × 103 of the passage 5 bacteria. Mock-infected mice received an intradermal injection of sterile BSK-H medium containing 6% rabbit serum. Rear ankle joints were measured in a blinded fashion as previously described (41). Briefly, with the rear joint of the mouse extended the thickest anterior-posterior portion of the ankle was measured using a metric caliper. Ankle measurements were taken at the time of infection and at the time of sacrifice. Data reflect the change in ankle measurement for individual mice over the duration of the infection. The rear ankle joint that demonstrated the greatest swelling was collected for histological analysis at the time of sacrifice. Joints were fixed in 10% formalin, decalcified, and embedded in paraffin. Sections were stained with H&E and then scored for histopathology in a blinded manner. The overall lesion score represents a combined assessment of neutrophil infiltration, mononuclear infiltration, tendon sheath thickness, and reactive/reparative responses. DNA was prepared from rear ankle, heart, and ear tissues at the time of sacrifice as previously described (27). Briefly, tissues were incubated overnight at 37°C in a 0.1% collagenase A (Roche, Indianapolis, IN) solution. An equal volume of 0.2 mg/ml proteinase K (Invitrogen Life Technologies, Carlsbad, CA) was added and samples were incubated overnight at 55°C. DNA was recovered by phenol-chloroform extraction and ethanol precipitation. DNA concentration was determined by optical density at 260 nm. Continuous fluorescent monitoring PCR was performed using the LightCycler (Roche) to assess B. burgdorferi levels in host tissues, as described previously (42). The copy number of the B. burgdorferi RecA gene and of the single-copy mouse gene coding for nidogen was calculated using the cycle threshold of amplification, determined with Roche LightCycler Software. RecA values were then normalized to nidogen copy number. The oligonucleotide primers used for quantification of B. burgdorferi RecA were ntm17.F (5′-GTG GAT CTA TTG TAT TAG ATG AGG CTC TCG-3′) and ntm17.R (5′-GCC AAA GTT CTG CAA CAT TAA CAC CTA AAG-3′). The oligonucleotide primers used for quantification of mouse nidogen were nido.F (5′-CCA GCC ACA GAA TAC CAT CC-3′) and nido.R (5′-GGA CAT ACT CTG CTG CCA TC-3′). Recombinant outer surface lipoprotein A (OspA) was obtained from Aventis Pasteur (Swiftwater, PA) contained ∼0.030 endotoxin U/μg of protein as determined by Limulus assay (Associates of Cape Cod, Falmouth, MA) (43). A crude lysate preparation of B. burgdorferi was prepared by sonication of a 10-day culture of the N40 strain of B. burgdorferi (44), and the protein concentration was determined using the bicinchoninic acid protein assay kit (Pierce, Rockford, IL). Escherichia coli K12, D31m4 (Re) LPS (List Biological Laboratories, Campbell, CA) was repurified by phenol extraction as previously described (45). Polyinosinic-polycytidylic acid was purchased from Amersham Biosciences (Piscataway, NJ). Abs and standards for cytokine ELISAs were obtained from BD PharMingen (San Diego, CA). Serum obtained from retro-orbital bleeding was assayed using an ELISA to quantify B. burgdorferi-specific Ab production. Ninety-six-well microtiter plates were coated with sonicated B. burgdorferi (5 μg/ml), and one column on each plate was reserved for polyclonal rabbit anti-mouse IgG, IgM, and IgA Ig (Zymed, San Francisco, CA). Purified IgG (Sigma), IgG1, IgG2b, or IgG3 (BD PharMingen) was added to Ab-coated wells to generate a standard curve. Serial dilutions of serum samples were added to the sonicate-coated wells and Ig content was measured by comparison to the standard curve on individual plates. Sera was collected at 28 days of infection from MyD88−/− or MyD88+/+ mice and pooled. Undiluted pooled sera (100 μl) were transferred to scid mice via i.p. injection. Twenty hours after Ab transfer, mice were infected intradermally with B. burgdorferi as described. Mice were sacrificed at 14 days, and infection was verified by culturing urinary bladders and by PCR amplification of the B. burgdorferi RecA gene. Bone marrow-derived macrophages from MyD88+/+, MyD88−/−, and TLR2−/− mice were obtained as previously described (46). Briefly, bone marrow cells were cultured for 6 days in RPMI supplemented with L929-conditioned medium at 37°C. Adherent macrophages were collected with cold PBS and replated in serum-free medium containing 1% Nutridoma (Roche). Cells were cultured overnight at 37°C and stimulated with the indicated agonists. For cytokine ELISA and nitrite assay, supernatants were collected 24 h after stimulation. For cell lysates, cells were washed with PBS and lysed in 50 mM Tris-HCl, pH 8.0, containing 137 mM NaCl, 10% (v/v) glycerol, Nonidet P-40, and Complete Protease inhibitor mixture (Roche) at the indicated times (47). Nuclei and cellular debris were pelleted, and lysates were collected. Protein concentration was determined using the Bradford assay (Bio-Rad, Hercules, CA). IκB-α Western blots were prepared by separating 6.5 μg of cell lysate on a 12% SDS-PAGE gel and transferring separated proteins to Immobilon-P membranes (Millipore, Bedford, MA). Blots were incubated with anti-mouse IκB-α (1:1000; Cell Signaling, Beverly, MA) followed by HRP-conjugated anti-rabbit Ab (Bio-Rad). Blots were developed using SuperSignal chemiluminescent substrate (Pierce). Western blot analysis of mouse sera was conducted as previously described (27). Briefly, 120 μg of N40 B. burgdorferi sonicate were separated on a 12% SDS-PAGE gel and transferred to Immobilon-P membranes. Blots were incubated with a 1/50 dilution of infected or control mouse sera. OspA and OspC were detected using rabbit polyclonal anti-OspC or a monoclonal anti-OspA, both provided by T. Schwan (Rocky Mountain Laboratories, Hamilton, MT). Bands were detected using alkaline phosphatase-conjugated goat anti-rabbit and goat anti-mouse IgG (Invitrogen Life Technologies). Data sets were analyzed using SPSS statistical analysis software (SPSS, Chicago, IL). Significant differences among groups were determined using ANOVA, implementing a variant of the F test that is robust to differences among groups with large variances (48). When significance was detected by ANOVA, pairwise comparisons were made using Tamhane’s T2 post hoc test (49). Statistical significance was defined as p < 0.05. Recent evidence has demonstrated that TLR2 plays a significant role in the host defense to B. burgdorferi with TLR2-deficient mice harboring 10- to 50-fold more B. burgdorferi than wild-type mice (27). Although macrophages from TLR2−/− mice did not produce cytokines in response to Borrelia lipoproteins, they did respond to a preparation derived from the whole spirochete, indicating that Borrelia factors could activate cells through TLR2-independent mechanisms. This finding suggested that host defense mechanisms could also be triggered by additional TLRs. Mice deficient in the adapter protein MyD88 allowed assessment of the contribution of MyD88, and all TLRs that are dependent on MyD88, to host defense simultaneously. The relative contribution of TLR2 and other TLRs were assessed quantitatively by measuring PCR determined B. burgdorferi levels in tissues of infected mice with targeted disruptions in TLR2 and MyD88. MyD88-deficient mice on the mildly arthritic C57BL/6 background and littermate controls were infected with B. burgdorferi, and the progression of disease was followed at 2, 4, and 8 wk. Two weeks of infection is associated with the greatest number of spirochetes in tissues of wild-type C57BL/6 mice, and spirochete levels were determined in ankle joints, hearts, and ears of MyD88-deficient mice. MyD88−/− mice had extremely high numbers of spirochetes in all three tissues at 2 wk of infection (Fig. 1⇓). Ankle tissues of MyD88−/− mice harbored the greatest number of B. burgdorferi, averaging 70-fold more spirochetes than MyD88+/+ and MyD88+/− littermates. Ear and heart tissues harbored an average of 3- to 7-fold more Borrelia compared with littermates at 2 wk. The high numbers of Borrelia in tissues of MyD88−/− mice at this early time point suggests a substantial failure of the innate immune response to B. burgdorferi in the absence of TLR/MyD88-dependent signaling. MyD88 plays a crucial role in the host defense to B. burgdorferi. Mice were infected with 2 × 103 B. burgdorferi (N40 isolate) and sacrificed 2 wk after infection. Ankle, ear, and heart tissues were collected to assess B. burgdorferi DNA levels using quantitative PCR for a single copy B. burgdorferi gene, RecA. Numbers reflect copies of B. burgdorferi RecA normalized to a single-copy mouse gene, nidogen. Each circle represents an individual mouse. B. burgdorferi levels in MyD88−/− mice were significantly different (p < 0.05) from MyD88+/+ and MyD88+/− littermates in ankle and heart using Tamhane’s T2 statistic. There was no statistical difference of B. burgdorferi levels between MyD88+/+ and MyD88+/− littermates. To examine whether B. burgdorferi persisted at high levels in tissues of MyD88−/− mice after the development of an IgG response, numbers of spirochetes were quantified 4 wk following infection (Fig. 2⇓). Additionally, TLR2-deficient mice were included in this time point for comparison. Ear and heart tissues of MyD88-deficient mice demonstrated a significant increase in spirochete levels at 4 wk, increasing >5-fold over the values at 2 wk. This was in sharp contrast to the wild-type littermate mice that showed partial clearance of B. burgdorferi in the ear and heart tissues between 2 and 4 wk. By 4 wk of infection MyD88-deficient mice averaged greater than 150-fold (ear) and 135-fold (heart) more spirochetes in tissues than littermate controls. Although there was not a strong increase of spirochete levels in the ankle tissue of MyD88−/− mice between 2 and 4 wk, the number of spirochetes in the ankle remained elevated, similar to the level detected at 2 wk and 100-fold more than in the wild-type mice. Multiple TLRs are involved in the host defense against B. burgdorferi. MyD88+/+, MyD88+/−, MyD88−/−, and TLR2−/− mice were infected with 2 × 103 B. burgdorferi and sacrificed 4 wk after infection. 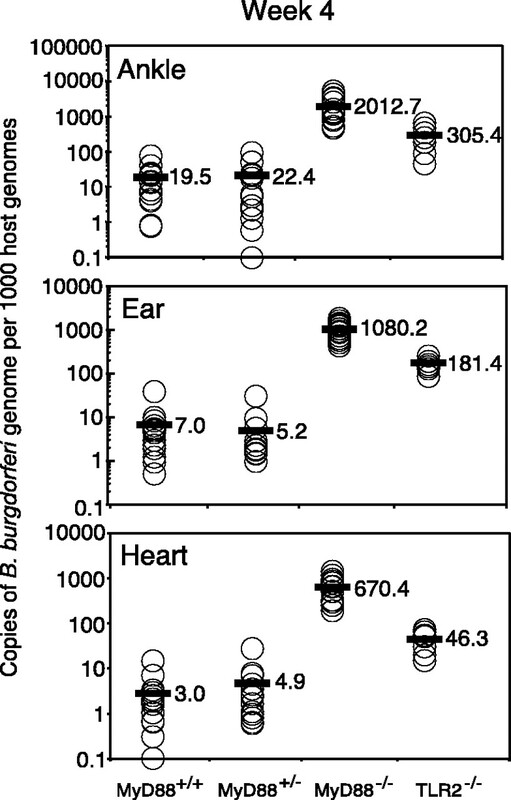 Tissues were collected to assess B. burgdorferi DNA levels using quantitative PCR, as described in Fig. 1⇑. For all tissues, B. burgdorferi levels in MyD88−/− mice were significantly different (p < 0.05) from MyD88+/+ and MyD88+/− littermates. Additionally, spirochete levels were significantly different in MyD88−/− mice from TLR2−/− mice (p < 0.05) using Tamhane’s T2 statistic. To determine the relative contribution of TLR2-dependent and TLR2-independent signaling in the host defense to B. burgdorferi, TLR2-deficient C57BL/6 mice were simultaneously infected and assessed at the 4-wk time point. As previously reported, TLR2-deficient mice harbored high numbers of spirochetes relative to wild-type C57BL/6 mice; however, this increase was quantitatively less than that displayed by MyD88-deficient mice (Fig. 2⇑). MyD88−/− mice had 6-fold more spirochetes in joint tissue and ear and 14-fold more spirochetes in heart tissue than TLR2-deficient mice infected simultaneously, p < 0.05 for all three tissues. These quantitative findings indicate that the defect in host defense seen in TLR2-deficient mice is even greater in the absence of all TLR signaling. B. burgdorferi continued to persist in tissues of MyD88−/− mice at elevated levels through 8 wk after infection. Spirochete levels remained higher in MyD88−/− mice than in littermate control mice (Fig. 3⇓). The average numbers of B. burgdorferi at 8 wk suggested there was partial clearance of Borrelia in ankle and heart tissues of MyD88−/− mice between 4 and 8 wk; however, MyD88−/− mice were unable to efficiently clear B. burgdorferi once high levels of spirochetes had been established in host tissues early during infection. B. burgdorferi numbers in tissues of MyD88-deficient mice at 8 wk. MyD88-deficient mice were infected at the same time as mice in Figs. 1⇑ and 2⇑ and sacrificed at 8 wk. B. burgdorferi numbers were determined as described. 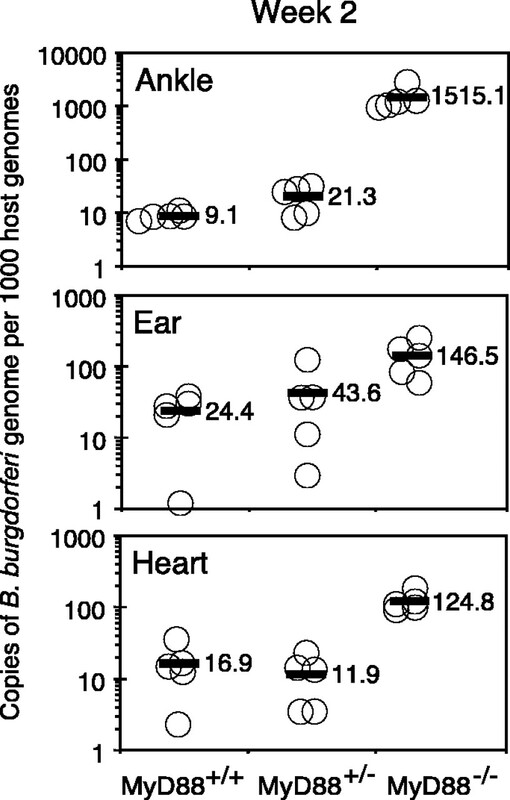 The presence of such high levels of B. burgdorferi in the joint, ear, and heart tissues of MyD88−/− mice prompted examination of spirochete levels in other tissues. In wild-type mice, B. burgdorferi are found at low levels and are often difficult to detect in the blood. Because there was such an abundance of Borrelia in the MyD88−/− mice, we tested to see whether spirochetes disseminated into the blood or blood-filtering organs in these animals. Even with the highly elevated numbers of spirochetes in joint, ear, and heart tissues of MyD88−/− mice over the course of infection, blood and spleens were only sporadically positive for PCR-detectable spirochetes, and at levels 100-fold less than those found in the tissues reported in Figs. 1–3⇑⇑⇑. This indicates that even in the absence of MyD88-dependent TLR signaling, blood and blood-filtering organs do not serve as reservoirs for B. burgdorferi. 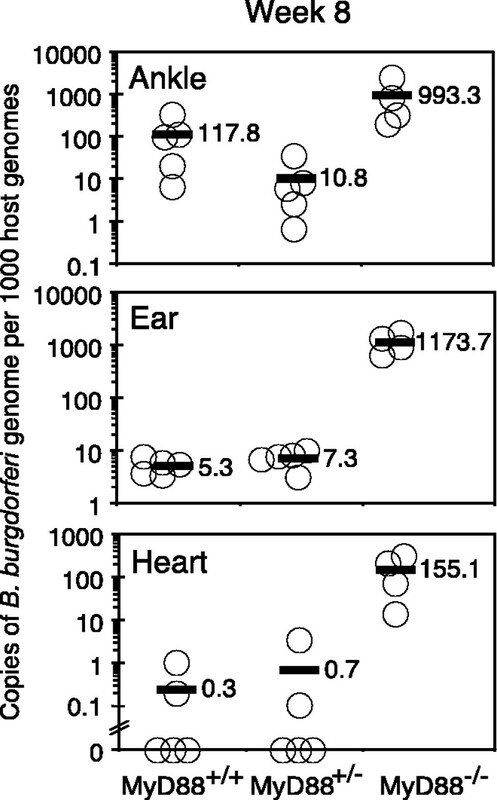 This finding supports previous observations with TLR2-deficient mice that harbored low levels of B. burgdorferi in blood in spleen despite elevated levels in ear, heart, and ankle joints. TLR signaling has been implicated as a link between the innate and adaptive immune responses by contributing to the up-regulation of MHC class II and costimulatory molecules (50). Interestingly, TLR2−/− mice did not show evidence of an altered Ab response after infection with B. burgdorferi (27); however, a defect in Ab production could serve as a contributing factor to the increasing levels of B. burgdorferi in tissues of MyD88−/− mice between 2 and 4 wk after infection. To determine whether Ab production was altered in MyD88−/− mice when challenged with B. burgdorferi, Ig levels were determined in sera collected at 2, 4, and 8 wk sacrifices. MyD88−/− mice produced lower levels of total B. burgdorferi-specific IgG (Table I⇓) and lower amounts of B. burgdorferi-specific isotype IgG2b (Table II⇓). In contrast, infected MyD88−/− mice produced significantly higher amounts of B. burgdorferi-specific IgG1 than wild-type mice. A similar trend of increased levels of B. burgdorferi-specific IgG1 had previously been observed in infected TLR2−/− mice (27). This distinction in isotype distribution between MyD88−/− and MyD88+/+ mice was further observed at 8 wk after infection (data not shown). Although the distribution of Ab isotype was altered in MyD88−/− mice, there was still a significant level of B. burgdorferi-specific Ab produced, and there was no absence of any particular isotype. Total IgG levels increase up to 5- to 10-fold in wild-type mice after infection with B. burgdorferi (41). IgG levels in MyD88−/− mice were similar to littermate controls after infection and increased >4-fold relative to uninfected mice (Table I⇑). The increase of total IgG demonstrated that there was not a global defect in Ig production in the response of MyD88−/− mice to infection with B. burgdorferi. Many microbial products stimulate APCs through TLRs, and it was possible that the pattern of Ags recognized by MyD88-deficient mice could be altered relative to wild-type mice. Western blot analysis was performed to compare the complexity of Ags recognized by sera from infected MyD88−/− mice and littermate controls (Fig. 4⇓). Sera from MyD88−/− mice recognized fewer bands in B. burgdorferi lysate and at a somewhat lower intensity than sera from wild-type mice; however, there still appeared to be complex Ag recognition by the Ab from MyD88-deficient mice. Diversity of Ags recognized by serum from infected MyD88-deficient mice. Abs directed against B. burgdorferi in sera from mice sacrificed at 4 wk were detected as described (Materials and Methods). Uninfected control sera were from MyD88+/+ and MyD88+/− mice. OspA and OspC were detected with monoclonal anti-OspA and rabbit polyclonal anti-OspC, respectively. To test the hypothesis that MyD88-deficient mice lacked Ab with a crucial effector function for controlling B. burgdorferi, sera transfer experiments were performed similar to those described by Barthold and Bockenstedt (51) to demonstrate the presence of protective Ab in sera of wild-type mice. scid mice served as recipients of nonimmune sera from uninfected wild-type mice or immune sera from 28-day infected wild-type or MyD88-deficient mice. These mice were challenged by intradermal injection with B. burgdorferi and sacrificed at 2 wk. The infection status was determined by culturing urinary bladder tissue from each animal and by performing real time PCR on ears, hearts, and ankle joints. Of the mice receiving nonimmune sera, 100% became infected on challenge, whereas fewer than 50% of mice receiving immune sera from either wild-type or MyD88−/− became infected on challenge (Table III⇓). This finding suggests that MyD88-deficient mice produce protective Ab when infected with B. burgdorferi. Therefore, the presence of extremely high numbers of B. burgdorferi in MyD88-deficient mice cannot be attributed to absence of protective Ab. We would suggest this defect in controlling B. burgdorferi levels is the result of a deficiency in clearance of spirochetes by effector cells of the innate inflammatory defense. MyD88-deficient mice were expected to lack inflammatory responses to microbial patterns known to signal through any of the TLRs. This suggested that MyD88-deficient mice would not display arthritis when infected with B burgdorferi. In fact, MyD88-deficient mice developed more severe arthritis, as assessed by ankle swelling and by histopathological scoring, whereas no abnormalities were found in joints from uninfected MyD88-deficient mice (Table IV⇓). Particularly notable was the increase in infiltration of neutrophils and mononuclear cells into the joint tissue of infected MyD88-deficient mice. These results are similar to those reported with TLR2-deficient mice (27), and repeated in Table V⇓. Thus, an intense inflammatory response was observed in the localized joint tissue of MyD88−/− mice. Do inflammatory cells from MyD88-deficient mice respond to B. burgdorferi products in vitro? The finding of severe arthritis and infiltration of neutrophils and mononuclear cells into the joints of infected MyD88-deficient mice was considered in light of the extremely high numbers of bacteria in these tissues. This argues that B. burgdorferi possess a ligand for inflammatory pathways not requiring MyD88. To test whether this stimulatory factor(s) was directly acting on inflammatory cells, purified populations of macrophages were derived from the bone marrow of wild-type and MyD88-deficient mice and stimulated with a sonicated preparation of B. burgdorferi. The production of IL-6 was assessed in supernatants collected at 24 h (Fig. 5⇓). MyD88-deficient cells failed to produce IL-6 in response to B. burgdorferi, but did respond to polyinosinic-polycytidylic acid, a synthetic dsRNA analog known to signal through TLR3 by both MyD88-dependent and MyD88-independent pathways. This finding suggests that sonicated B. burgdorferi fails to stimulate the nuclear translocation of NF-κB in MyD88-deficient cells. This hypothesis was tested directly by assessing the disappearance of cellular IκB-α from stimulated cells (Fig. 5⇓). All three stimuli that were tested induced rapid disappearance of IκB-α from the wild-type macrophages by 10 min, with reappearance by 30–60 min. OspA failed to cause IκB-α disappearance from macrophages lacking TLR2 or MyD88. LPS treatment resulted in disappearance of IκB-α in TLR2-deficient macrophages with normal kinetics. The only stimulant capable of causing the disappearance of IκB-α from MyD88-deficient macrophages was LPS, and at a later time point than in wild-type macrophages. This result is consistent with published reports documenting a delay in NF-κB activation when only the MyD88-independent pathway of TLR4 signaling is functional (52). Sonicated B. burgdorferi triggered very slight loss of IκB-α in TLR2-deficient macrophages, similar to the slight induction of IL-6 and NO production by those cells. B. burgdorferi treatment of MyD88-deficient macrophages had no effect on IκB-α in these cells, also consistent with the inability of these cells to produce IL-6 in response to sonicated B. burgdorferi. Response of macrophages from MyD88−/− mice to B. burgdorferi sonicate. After a 24 h stimulation of MyD88+/+, MyD88−/−, and TLR2−/− bone marrow-derived macrophages with the indicated agonists, IL-6 levels were determined by ELISA (A) and nitrite production was quantified using the Greiss method (B). Degradation of IκB-α, an inhibitor of NF-κB, was followed by Western blot analysis of lysates from bone marrow-derived macrophages (C). Poly I:C, Polyinosinic-polycytidylic acid. Surprisingly, sonicated B. burgdorferi did elicit the production of relatively low levels of NO from MyD88-deficient macrophages costimulated with IFN-γ. Regulation of iNOS production is complicated and involves both transcriptional and translational control. 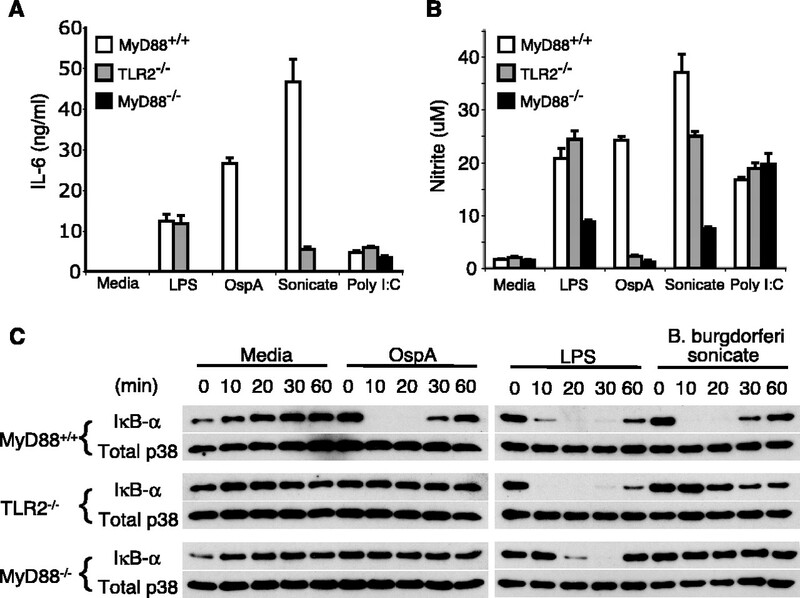 This finding suggests that a MyD88-independent pathway can contribute to iNOS expression in response to B. burgdorferi. TLR signaling comprises an important part of the host response to B. burgdorferi. 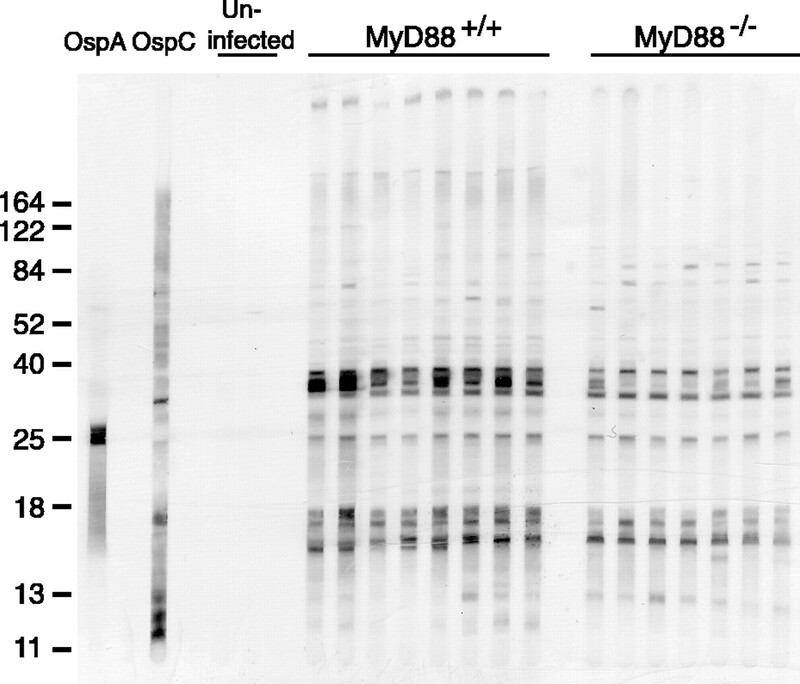 Multiple experiments using MyD88-deficient mice demonstrated a severe defect in host defense to B. burgdorferi after both short and long term infection. MyD88-deficient mice showed a quantitative difference of >100-fold greater number of spirochetes at 4 wk than with wild-type littermates. In addition, a key observation from our infection studies showed that Borrelia numbers in MyD88-deficient animals were >6-fold greater than those observed in TLR2-deficient mice in all three tissues examined. This unexpected, and previously unrecognized, contribution of TLRs other than TLR2 in the host defense to B. burgdorferi is an important factor to note in the control of spirochete numbers. This finding indicates that the response to nonlipoprotein components of B. burgdorferi plays an important role in host defense. Several recent reports have explored the defective host defense and inflammatory response to several pathogens in MyD88-deficient mice, including S. aureus, L. monocytogenes, T. gondii, M. tuberculosis, and Trypanosoma cruzi (33, 34, 35, 36, 37, 53). Similar to the results presented here, these studies demonstrated increased susceptibility to infection evidenced by an inability of MyD88-deficient mice to control pathogen levels. In three studies, susceptibility to infection in MyD88-deficient mice was found to be greater than in mice deficient in individual TLRs (33, 37, 53). Interestingly, these represent a spectrum of pathogens including Gram-positive S. aureus, parasitic protozoa, and M. tuberculosis. Thus, our findings with B. burgdorferi further points to the complexity of host defenses that are involved in responses to a variety of pathogens. MyD88-deficient mice were able to maintain stable levels and partially clear B. burgdorferi from tissues between 4 and 8 wk of infection. Given that Abs are involved in the clearance of B. burgdorferi, this suggested that the adaptive immune response to B. burgdorferi was functional in MyD88-deficient mice. Although B. burgdorferi-specific isotype levels showed an altered distribution, our findings suggest that MyD88-dependent signaling is not essential for the production of B. burgdorferi-specific Abs. These findings are consistent with another report using L. monocytogenes, demonstrating that adaptive immunity can be generated toward pathogens during infection in the absence of MyD88 (54). The distinct isotype distribution that we observed is supported by results from immunization studies that showed a Th2-skewed immune response in MyD88-deficient mice (55, 56). Passive transfer experiments indicated that Abs generated during infection of MyD88-deficient mice with B. burgdorferi were capable of protecting >50% of naive mice from infection. The presence of a strong and protective Ab response in MyD88-deficient mice suggested that the high number of spirochetes in tissues was due to failure of the innate immune response. Thus, TLR/MyD88-dependent signaling plays a critical role in host defense to B. burgdorferi during the establishment of infection, whereas additional factors such as IgG contribute to clearance of spirochetes after 4 wk. The inability of MyD88-deficient mice to resolve spirochete numbers could be due to a defect in the ability of a particular cell type of the innate response to kill B. burgdorferi. Macrophages and neutrophils express TLRs and are highly recruited to joint tissue after infection of wild-type mice. Interestingly, mononuclear and polymorphonuclear neutrophils were also highly recruited to the joint tissue of infected MyD88-deficient mice. However, when macrophages were treated with a lysate preparation of B. burgdorferi in vitro, they failed to activate NF-κB. Whether this failure to stimulate the macrophages affects the ability of the host to control and kill B. burgdorferi will require further studies. The absence of an in vitro macrophage response to B. burgdorferi (Fig. 5⇑) was surprising in light of the strong inflammatory arthritis displayed by infected MyD88-deficient mice. A MyD88 deficiency did not protect mice from either ankle swelling or histopathological lesions, indicating that arthritis development can occur in the absence of MyD88-dependent signaling. These findings suggest that MyD88-independent events facilitate recruitment of inflammatory cells into the joint tissue. Possible contributors to this response include localized production of chemokines (57), localized activation of complement (58), or release of chemotactic peptides by the invading bacterium. Interestingly, we find that our model is in striking contrast to a recent report using a mouse model for streptococcal cell wall-induced joint inflammation where a functional TLR2/MyD88 signaling pathway was essential for joint swelling and inflammatory cell recruitment (38). This may reflect the difference between arthritis caused by tissue invasion of a living pathogen vs the inflammatory response directed to large concentrations of bacterial products. Further studies will be required to define the MyD88-independent pathways involved in Lyme arthritis development. In summary, our results highlight an important dichotomy between host defense and inflammatory Lyme arthritis. We observed robust recruitment of neutrophils and monocytes to joint tissue in MyD88-deficient mice. This is in contrast to the inability of these cells to respond to B. burgdorferi components in vitro. Once at the site of infection, the recruited neutrophils and monocytes in MyD88-deficient mice displayed a failure in killing of the localized bacteria. This finding is interesting in light of a recent publication by Brown et al. (57) in which chemokine-deficient mice failed to recruit neutrophils to tissues and failed to develop arthritis. In this case, spirochete numbers in tissues were successfully controlled and therefore not dependent on chemokine-mediated recruitment of neutrophils. The situation of the MyD88-deficient mouse suggests a complex interaction between inflammation and host defense, with the presence of extremely high numbers of bacteria in tissues resulting in recruitment of inflammatory cells that are incapable of clearing the high numbers of bacteria. These findings suggest that distinct pathways participate in inflammatory cell recruitment and bacterial killing. We thank Tom Schwan at the Rocky Mountain Laboratories for anti-OspA and anti-OspC, Dr. Rich Holubkov of the biostatistical core resource at the University of Utah School of Medicine for consultation on statistical analysis methods, S. Barthold for helpful suggestions, Ying Wang for maintaining the TLR2−/− mouse colony, and Hillary Crandall for critical reading of the manuscript. ↵1 This work was supported by U.S. Public Health Service Grants AI-32223 and AI-43521 (to J.J.W. ), AI-24158 and AI-42032 (to J.H.W. ), 5P30-CA-42014 to the University of Utah and by funds from Associated Regional University Pathologists, and National Institutes of Health Training Grant GM07464 (to D.D.B.). ↵3 Abbreviations used in this paper: MyD88, myeloid differentiation factor 88; OspA, outer surface protein A; OspC, outer surface protein C.
Burgdorfer, W., A. G. Barbour, S. F. Hayes, J. L. Benach, E. Grunwaldt, J. P. Davis. 1982. Lyme disease: a tick-borne spirochetosis?. Science 216:1317. Nocton, J. J., A. C. Steere. 1995. Lyme disease. Adv. Intern. Med. 40:69. Rahn, D. W., S. E. Malawista. 1991. Lyme disease. West. J. Med. 154:706. Barthold, S. W., D. S. Beck, G. M. Hansen, G. A. Terwilliger, K. D. Moody. 1990. Lyme borreliosis in selected strains and ages of laboratory mice. J. Infect. Dis. 162:133. Nocton, J. J., F. Dressler, B. J. Rutledge, P. N. Rys, D. H. Persing, A. C. Steere. 1994. Detection of Borrelia burgdorferi DNA by polymerase chain reaction in synovial fluid from patients with Lyme arthritis. N. Engl. J. Med. 330:229. Yang, L., J. H. Weis, E. Eichwald, C. P. Kolbert, D. H. Persing, J. J. Weis. 1994. Heritable susceptibility to severe Borrelia burgdorferi-induced arthritis is dominant and is associated with persistence of large numbers of spirochetes in tissues. Infect. Immun. 62:492. Wooten, R. M., V. R. Modur, T. M. McIntyre, J. J. Weis. 1996. Borrelia burgdorferi outer membrane protein A induces nuclear translocation of nuclear factor-κB and inflammatory activation in human endothelial cells. J. Immunol. 157:4584. Ma, Y., K. P. Seiler, K. F. Tai, L. Yang, M. Woods, J. J. Weis. 1994. Outer surface lipoproteins of Borrelia burgdorferi stimulate nitric oxide production by the cytokine-inducible pathway. Infect. Immun. 62:3663. Norgard, M. V., L. L. Arndt, D. R. Akins, L. L. Curetty, D. A. Harrich, J. D. Radolf. 1996. Activation of human monocytic cells by Treponema pallidum and Borrelia burgdorferi lipoproteins and synthetic lipopeptides proceeds via a pathway distinct from that of lipopolysaccharide but involves the transcriptional activator NF-κB. Infect. Immun. 64:3845. Morrison, T. B., J. H. Weis, J. J. Weis. 1997. Borrelia burgdorferi outer surface protein A (OspA) activates and primes human neutrophils. J. Immunol. 158:4838. Hoshino, K., O. Takeuchi, T. Kawai, H. Sanjo, T. Ogawa, Y. Takeda, K. Takeda, S. Akira. 1999. Cutting edge: Toll-like receptor 4 (TLR4)-deficient mice are hyporesponsive to lipopolysaccharide: evidence for TLR4 as the Lps gene product. J. Immunol. 162:3749. Chow, J. C., D. W. Young, D. T. Golenbock, W. J. Christ, F. Gusovsky. 1999. Toll-like receptor-4 mediates lipopolysaccharide-induced signal transduction. J. Biol. Chem. 274:10689. Lien, E., T. K. Means, H. Heine, A. Yoshimura, S. Kusumoto, K. Fukase, M. J. Fenton, M. Oikawa, N. Qureshi, B. Monks, et al 2000. Toll-like receptor 4 imparts ligand-specific recognition of bacterial lipopolysaccharide. J. Clin. Invest. 105:497. Hayashi, F., K. D. Smith, A. Ozinsky, T. R. Hawn, E. C. Yi, D. R. Goodlett, J. K. Eng, S. Akira, D. M. Underhill, A. Aderem. 2001. The innate immune response to bacterial flagellin is mediated by Toll- like receptor 5. Nature 410:1099. Aliprantis, A. O., R. B. Yang, M. R. Mark, S. Suggett, B. Devaux, J. D. Radolf, G. R. Klimpel, P. Godowski, A. Zychlinsky. 1999. Cell activation and apoptosis by bacterial lipoproteins through toll-like receptor-2. Science 285:736. Hirschfeld, M., C. J. Kirschning, R. Schwandner, H. Wesche, J. H. Weis, R. M. Wooten, J. J. Weis. 1999. Cutting edge: inflammatory signaling by Borrelia burgdorferi lipoproteins is mediated by toll-like receptor 2. J. Immunol. 163:2382. Lien, E., T. J. Sellati, A. Yoshimura, T. H. Flo, G. Rawadi, R. W. Finberg, J. D. Carroll, T. Espevik, R. R. Ingalls, J. D. Radolf, D. T. Golenbock. 1999. Toll-like receptor 2 functions as a pattern recognition receptor for diverse bacterial products. J. Biol. Chem. 274:33419. Takeuchi, O., A. Kaufmann, K. Grote, T. Kawai, K. Hoshino, M. Morr, P. F. Muhlradt, S. Akira. 2000. Cutting edge: preferentially the R-stereoisomer of the mycoplasmal lipopeptide macrophage-activating lipopeptide-2 activates immune cells through a Toll-like receptor 2- and MyD88-dependent signaling pathway. J. Immunol. 164:554. Yoshimura, A., E. Lien, R. R. Ingalls, E. Tuomanen, R. Dziarski, D. Golenbock. 1999. Cutting edge: recognition of Gram-positive bacterial cell wall components by the innate immune system occurs via Toll-like receptor 2. J. Immunol. 163:1. Alexopoulou, L., V. Thomas, M. Schnare, Y. Lobet, J. Anguita, R. T. Schoen, R. Medzhitov, E. Fikrig, R. A. Flavell. 2002. Hyporesponsiveness to vaccination with Borrelia burgdorferi OspA in humans and in TLR1- and TLR2-deficient mice. Nat. Med. 8:878. Takeuchi, O., S. Sato, T. Horiuchi, K. Hoshino, K. Takeda, Z. Dong, R. L. Modlin, S. Akira. 2002. Cutting edge: role of Toll-like receptor 1 in mediating immune response to microbial lipoproteins. J. Immunol. 169:10. Wooten, R. M., Y. Ma, R. A. Yoder, J. P. Brown, J. H. Weis, J. F. Zachary, C. J. Kirschning, J. J. Weis. 2002. Toll-like receptor 2 is required for innate, but not acquired, host defense to Borrelia burgdorferi. J. Immunol. 168:348. Wesche, H., W. J. Henzel, W. Shillinglaw, S. Li, Z. Cao. 1997. MyD88: an adapter that recruits IRAK to the IL-1 receptor complex. Immunity 7:837. Muzio, M., J. Ni, P. Feng, V. M. Dixit. 1997. IRAK (Pelle) family member IRAK-2 and MyD88 as proximal mediators of IL-1 signaling. Science 278:1612. Burns, K., F. Martinon, C. Esslinger, H. Pahl, P. Schneider, J. L. Bodmer, F. Di Marco, L. French, J. Tschopp. 1998. MyD88, an adapter protein involved in interleukin-1 signaling. J. Biol. Chem. 273:12203. Adachi, O., T. Kawai, K. Takeda, M. Matsumoto, H. Tsutsui, M. Sakagami, K. Nakanishi, S. Akira. 1998. Targeted disruption of the MyD88 gene results in loss of IL-1- and IL-18-mediated function. Immunity 9:143. Medzhitov, R., P. Preston-Hurlburt, E. Kopp, A. Stadlen, C. Chen, S. Ghosh, C. A. Janeway, Jr. 1998. MyD88 is an adaptor protein in the hToll/IL-1 receptor family signaling pathways. Mol. Cell 2:253. Takeuchi, O., K. Hoshino, S. Akira. 2000. Cutting edge: TLR2-deficient and MyD88-deficient mice are highly susceptible to Staphylococcus aureus infection. J. Immunol. 165:5392. Scanga, C. A., J. Aliberti, D. Jankovic, F. Tilloy, S. Bennouna, E. Y. Denkers, R. Medzhitov, A. Sher. 2002. Cutting edge: MyD88 is required for resistance to Toxoplasma gondii infection and regulates parasite-induced IL-12 production by dendritic cells. J. Immunol. 168:5997. Feng, C. G., C. A. Scanga, C. M. Collazo-Custodio, A. W. Cheever, S. Hieny, P. Caspar, A. Sher. 2003. Mice lacking myeloid differentiation factor 88 display profound defects in host resistance and immune responses to Mycobacterium avium infection not exhibited by Toll-like receptor 2 (TLR2)- and TLR4-deficient animals. J. Immunol. 171:4758. Joosten, L. A., M. I. Koenders, R. L. Smeets, M. Heuvelmans-Jacobs, M. M. Helsen, K. Takeda, S. Akira, E. Lubberts, F. A. van de Loo, W. B. van den Berg. 2003. Toll-like receptor 2 pathway drives streptococcal cell wall-induced joint inflammation: critical role of myeloid differentiation factor 88. J. Immunol. 171:6145. Leadbetter, E. A., I. R. Rifkin, A. M. Hohlbaum, B. C. Beaudette, M. J. Shlomchik, A. Marshak-Rothstein. 2002. Chromatin-IgG complexes activate B cells by dual engagement of IgM and Toll-like receptors. Nature 416:603. Werts, C., R. I. Tapping, J. C. Mathison, T. H. Chuang, V. Kravchenko, I. Saint Girons, D. A. Haake, P. J. Godowski, F. Hayashi, A. Ozinsky, et al 2001. Leptospiral lipopolysaccharide activates cells through a TLR2-dependent mechanism. Nat Immunol. 2:346. Yang, L., Y. Ma, R. Schoenfeld, M. Griffiths, E. Eichwald, B. Araneo, J. J. Weis. 1992. Evidence for B-lymphocyte mitogen activity in Borrelia burgdorferi-infected mice. Infect. Immun. 60:3033. Morrison, T. B., Y. Ma, J. H. Weis, J. J. Weis. 1999. Rapid and sensitive quantification of Borrelia burgdorferi-infected mouse tissues by continuous fluorescent monitoring of PCR. J. Clin. Microbiol. 37:987. Yoder, A., X. Wang, Y. Ma, M. T. Philipp, M. Heilbrun, J. H. Weis, C. J. Kirschning, R. M. Wooten, J. J. Weis. 2003. Tripalmitoyl-S-glyceryl-cysteine-dependent OspA vaccination of Toll-like receptor 2-deficient mice results in effective protection from Borrelia burgdorferi challenge. Infect. Immun. 71:3894. Schoenfeld, R., B. Araneo, Y. Ma, L. M. Yang, J. J. Weis. 1992. Demonstration of a B-lymphocyte mitogen produced by the Lyme disease pathogen, Borrelia burgdorferi. Infect. Immun. 60:455. Hirschfeld, M., Y. Ma, J. H. Weis, S. N. Vogel, J. J. Weis. 2000. Cutting edge: repurification of lipopolysaccharide eliminates signaling through both human and murine Toll-like receptor 2. J. Immunol. 165:618. Brown, J. P., J. F. Zachary, C. Teuscher, J. J. Weis, R. M. Wooten. 1999. Dual role of interleukin-10 in murine Lyme disease: regulation of arthritis severity and host defense. Infect. Immun. 67:5142. Chan, E. D., D. W. Riches. 2001. IFN-γ + LPS induction of iNOS is modulated by ERK, JNK/SAPK, and p38mapk in a mouse macrophage cell line. Am. J. Physiol. Cell Physiol. 280:C441. Brown, M. B., A. B. Forsythe. 1974. Robust tests for the equality of variances. J. Am. Statist. Assoc. 69:364. Tamhane, A. C.. 1979. A comparison of procedures for multiple comparisons of means with unequal variances. J. Am. Statist. Assoc. 74:471. Barthold, S. W., L. K. Bockenstedt. 1993. Passive immunizing activity of sera from mice infected with Borrelia burgdorferi. Infect. Immun. 61:4696. Kaisho, T., O. Takeuchi, T. Kawai, K. Hoshino, S. Akira. 2001. Endotoxin-induced maturation of MyD88-deficient dendritic cells. J. Immunol. 166:5688. Campos, M. A., M. Closel, E. P. Valente, J. E. Cardoso, S. Akira, J. I. Alvarez-Leite, C. Ropert, R. T. Gazzinelli. 2004. Impaired production of proinflammatory cytokines and host resistance to acute infection with Trypanosoma cruzi in mice lacking functional myeloid differentiation factor 88. J. Immunol. 172:1711. Kaisho, T., K. Hoshino, T. Iwabe, O. Takeuchi, T. Yasui, S. Akira. 2002. Endotoxin can induce MyD88-deficient dendritic cells to support Th2 cell differentiation. Int. Immunol. 14:695. Brown, C. R., V. A. Blaho, C. M. Loiacono. 2003. Susceptibility to experimental Lyme arthritis correlates with KC and monocyte chemoattractant protein-1 production in joints and requires neutrophil recruitment via CXCR2. J. Immunol. 171:893. Lawrenz, M. B., R. M. Wooten, J. F. Zachary, S. M. Drouin, J. J. Weis, R. A. Wetsel, S. J. Norris. 2003. Effect of complement component C3 deficiency on experimental Lyme borreliosis in mice. Infect. Immun. 71:4432.